Caught bait this morning and picked clients up at 5:30 am and went in search of Schools of Stripers. Looked for 3 minutes and found a nice school and put out 8 downlines, fished that school for 20 minutes catching 12 Stripers and 5 Cats. This school was in a deep channel bend so I went to the next channel bend in the river and "WOW", found a school that was 3 acres big stacked 25' tall. I told the guys to get ready for the fastest action of their life and tried to put lines out but the fish hit as soon as we engaged the reels. 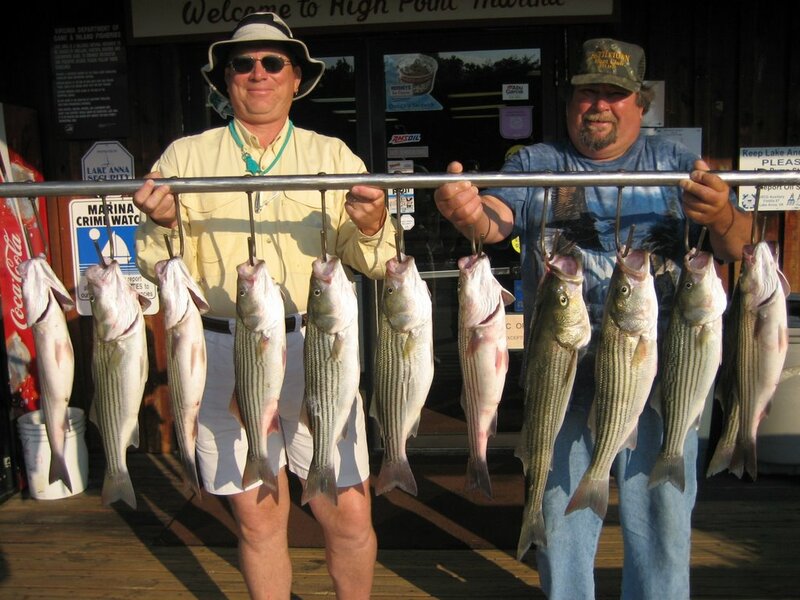 We caught another 15 Stripers in 10 minutes ! 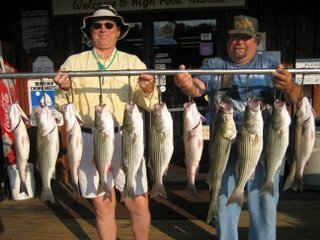 By 7 am we had caught at least 25 Stripers , clients keeping 12 of 'um . I overheard Bobby telling Tom " This is great, the moon is still out, it's 7 oclock, we have caught our limits and I can be back home to cut hay before the dew gets off the fields".